With summer inevitably wrapping up, and the clubbing season just knocking on the club land's door, Seva Records and Deep Smoke are back with a third installment of party Fusion. Be sure that there are lots of good events in store for you. 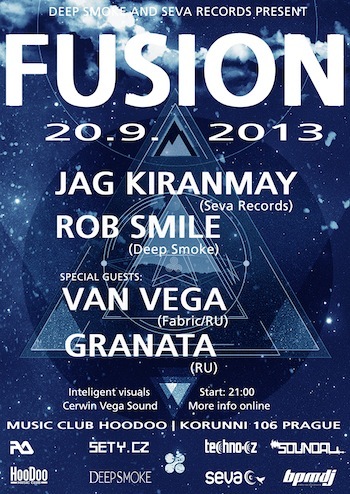 First off, In an attempt to achieve cozier atmosphere and more home-like vibe, Fusion night is scaling down to one room only. This however is the only corner we decided to cut. As always music is the most important element here and as we love 'underground beats' you can look forward to four uniquely sounding artists throughout the night. 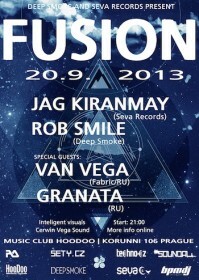 Fusion favorites Jag Kiranmay and Rob Smile plus their two guests Van Vega and Dj Granata. No other venue than prague club Hoodoo would provide more fitting setting. With super charged sound system by Cerwin Vega and stunning visuals and lights, you can count on a great night experience.